Get welcomed in true Gwalior tradition. Enter at this 120-year-old palace, which has played host to the King of England and is now a heritage hotel. Set amidst 9 acres of beautifully landscaped lawns, this regal palace, rich in history, is outfitted with artistic stone carvings and delicate filigree work. 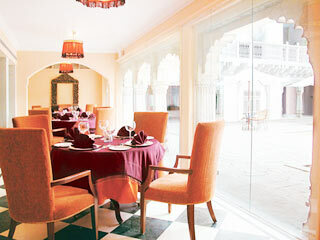 Conveniently located the hotel is just 25 kms from the Gwalior Airport (GWL)and 3 kms from the railway station. Wedding Services, Currency Exchange, Swimming Pool, Doctor on Call, Complimentary Newspapers in Lobby, Backup Generator, Beauty Services, Exhibit Space, Security Guard, Room Service. Attached Bathroom, Cable/Satellite TV, Hair Dryer, Smoking Rooms, Room Heater, Air Conditioning Room, Reading Lamps, Complimentary Newspaper, Slippers, Internet Access. ATM/Banking, Banquet Facilities, Beauty Services, Business Facilities, Conference Hall, Doctor on Call, Laundry Facilities, Parking, Restaurant, Room Service, Bar. User reviews for "Usha Kiran Palace Hotel Gwalior"